September 13 saw the official opening of the King Street Theatre Centre with the world première of Gary Kirkham's "Queen Milli of Galt". The new centre now becomes the permanent home of Kitchener's resident troupe, Theatre & Company. Few theatre companies can count themselves as lucky as this one. In this only their twelfth season they have a purpose-built home with solid community backing: 93% of the funding comes from private donors. The $3.7 facility houses the Warnock MacMillan Theatre that permits four different seating configurations for 253-353 people, rehearsal space, offices and construction shops for sets and costumes. With the Centre in the Square, already reknowned as a venue for music, the King Street Theatre Centre gives Kitchener performance facilities many larger communities can only dream of. 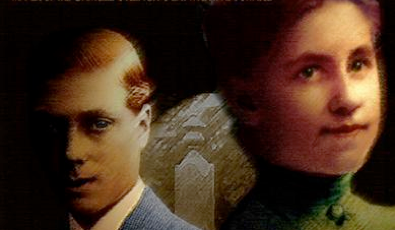 The play takes as its subject Millicent Milroy (1894-1972), a schoolteacher in Galt, who shortly after the death of the exiled Edward VIII in 1972 had her tombstone engraved "Wife of Edward VIII, Duke of Windsor". Indeed, in 1919 the 24-year-old Prince of Wales had been on a goodwill tour of the Empire stopping in Galt for about four hours, but there is no record that he and Milli, then 29, ever met. Until her death in 1985 she maintained she had a morganatic marriage with Edward. Her monument still stands in Galt's Mount View Cemetery. Given the few facts we know of Miss Milroy, the most obvious approach might have been to examine how the woman could have come to be so deluded. Kirkham, however, invents a story to show how Milli's tombstone statement could possibly be true. The trouble is that the fiction he invents is none other than the plot for so many early 20th-century operettas like Sigmund Romberg's "The Student Prince" or Franz Lehár's "The Czarevich". As in these works, a young man of noble rank falls in love with a young woman of low degree. He must choose between the crown and his beloved, but she, recognizing his greater destiny, foreswears her love. Milli becomes the first Wallis Simpson who the future Edward VIII has the misfortune to meet when still under his father's command. The frame for the action is set sometime after 1972 when a journalist for a local paper attempts to discover from the reclusive Milli why she has had such a statement engraved on her memorial. After a blackout we shift to 1919 where Kirkham has extended Edward's visit from four hours to several days. Since the elderly Milli has flatly refused to talk to the journalist, it is unclear whether the action in 1919 is merely her private memory of events or the story she is telling the journalist. The fact that all the other actors but Milli have costume changes suggests the former, but by the end we find it is the latter. Removing the blackout and adding appropriate stage business would help clarify this point and cause people not to ask, as they did, why Milli would wear the same drab dress even to a society ball. Kirkham is caught between the desire to have Milli remain enigmatic and to explain her actions. The result is there are problems with both the mood of the play and the motivation of the title character. Kirkham wants to create a bittersweet mood leavened by humour generated primarily by Milli's monarchist mother and by Edward himself, who is pictured as a kind of elegant and sporty Bertie Wooster. But Milli's grief for the loss of her beau in World War I is so strongly emphasized that the transitions to humorous scenes and back are uneasy. To make Edward's courtship of Milli more dramatic, Kirkham gives Milli an animus toward him that is never explained. At first I assumed that she, alone among the women of Galt, is uninterested in the "most handsome man in the Empire" because of her grief. As the play progresses, however, it seems that she has bolshevik leanings. How this came about given her mother's idolatry of the monarchy, is never clear. With the central character's motivations so foggy, it is difficult to see how she could fall in love with someone she treats almost exclusively with derision. To make Milli too enigmatic means Edward's winning of her and later her renunciation of him never has the tension or impact they ought. The show is ideally cast. Miriam Brown is good at distinguishing the elderly Milli from the younger. She makes us see that Milli uses an outward show of strength to hide an inward fragility. She is excellent at communicating a subtext of grief beneath Milli's behaviour in Act 1, but Kirkham needs to enrich her character further if we can understand her actions in Act 2. Andrew Lakin also well distinguishes his two roles--the journalist and Edward himself. The doubling would suggest that Milli finally speaks to the journalist because he resembles her royal wooer, but nothing is made of this. His impersonation of the petulant but slightly dim-witted Prince is the chief source of pleasure in the play. Kathleen Sheehy is also very funny as Mrs. Milroy, the leader of a prayer circle who has difficulty reconciling her adulation of the monarchy with her religion. The other two roles of Edward's man Godfrey, played by Alan Sapp, and Milli's friend Mona, played by Alyson Scadron-Wattles, are underwritten. Since Kirkham makes Edward so like Wooster, it would seem natural to make his valet like Jeeves. But both he and Sapp want to pull the character away from that course even though more humour would lie in that direction. Mona is there mostly as a foil for Milli (i.e., Edward chooses the drab, hard-to-get Milli over the vivacious, easy-to-get Mona), but Kirkham needs to supply more background to suggest how two such opposites are still fast friends. For this show the theatre is set for 279 seats surrounding the stage on three sides. Freed from the confines of low-ceilinged Market Theatre, the design team makes full use of the two storeys of space between the stage and catwalks above. Dennis Horn's set has three playing areas--one for the Prince and the interior and exterior of the Milroy house, denoted by a staircase and a suspended tree branch. He has chosen an autumnal palette for his design appropriate for the heavy-heartedness of the piece. Renée Brode reinforces this with beautiful lighting making much use of red and yellow gels and leafy texturing. Director Stuart Scadron-Wattles chooses a slowish pace, suited to the general aura of melancholy but inhibiting the full humour of numerous scenes. The text doesn't give him much room to compensate for the awkward shifts in mood. The decision was absolutely right to open the King Street Theatre Centre with a new play by a local playwright on a local subject. If the play requires more reworking to be fully successful, the same is not true of the splendid new theatre. One hopes the commitment Kitchener has shown toward the arts and to its resident theatre company will be a model for other communities across the country. Photo: Cover of Samuel French edition of Queen Milli of Galt. ©2005.